1 Is electric radiant heat efficient for you to convert your house over from forced-air or baseboard heat? Is electric radiant heat efficient for you to convert your house over from forced-air or baseboard heat? 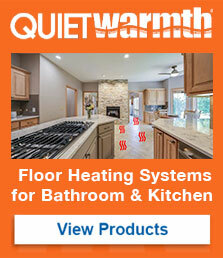 heat your floors compared to forced air or baseboard heaters? In this article you will find out there are two common choices for heating. Forced air and radiant heat and which one is more efficient to heat up your floors. Forced air heating is simply air carrying warmth through air ducts in your home. Powered by natural gas creating a flame to heat up the air and a blower to push the air to the center of your home. But how much heat is lost between the source and the destination? The opportunity for the warm air to cool down when traveling through vents increases with more travel. Each vent systems are not perfect and air is leaked through cracks. Once the warm air reaches the destination, the warm air rises to the ceiling to leave you moderately warm. Ductwork also collects and distributes dust and other impurities, including germs. With forced air recirculation the dust and germs can recirculate in your household causing illness. It is ideal to change your filter regularly to optimize indoor air quality. Taking up 45% of your energy bills according to U.S. Department of Energy, forced air isn’t very efficient in our books. Baseboard is a close relative of forced air except it has no ductwork, filter and is electric powered. Matched up with poor placement of baseboards, the units generally end up heating outside walls and not internal walls. For example, if placing baseboards under windows, the cold window glass cools the warmer room air next to the glass, and that cool air drops like a rock to the floor. Also, traditional heaters need to heat up to 149-167 degrees Fahrenheit, consuming more energy to heat up your floor. According to U.S. Department of Energy, baseboard heating is the most expensive way to heat your home. Radiant heat offers even distribution of heat through the room with little to no loss. This is produced by transfer energy, which is heat makes direct contact with the surface. The heat then radiates off of the surface. The heat is not lost during distribution due to transfer heat. Heat will rise to the ceiling but the source starts from the flooring and follows up to the ceiling. No germs/dust can collect inside ductwork of a radiant heating system. No system in place to push allergens in the air. According to U.S Department of Energy, radiant heat has a number of advantages over other forms of heat distribution. Due to no loss of heat with distribution and indoor air quality, radiant heat is the clear winner in energy efficiency. But there are different radiant heat systems on the market? Is the hydronic system or electric radiant heat more efficient? Hydronic systems is basically hot water running through ½” PEX piping through your flooring/walls. A standalone boiler is needed to heat up the water which pushes the water through the piping. It takes the boiler a while to heat up the water but once done, it can provide gentle heat to floors and walls. Depending on the boiler (gas or electric), gas is more cost efficient than electric. If you are looking to install an electric boiler, you should consider the electric radiant heat system due to maintenance as it would cost the same to heat up your room. Hydronic systems have to be maintained every other year for optimum performance. Electric radiant heat is a cable or film that generates warmth by alternating currents running in a mat or cable system. The mat is powered by electricity (120V or 240V) which is the same cost as hydronic system – Electric Boiler but no maintenance is needed plus quick installation time makes this ideal for DIY or contractors. As you have read through the article, the hydronic system – gas boiler is the most efficient but you have to also look at your time installing the system, maintenance involved and basically what you are comfortable with in your home.